There’s a larger version of this map here! It’s also available as a poster. 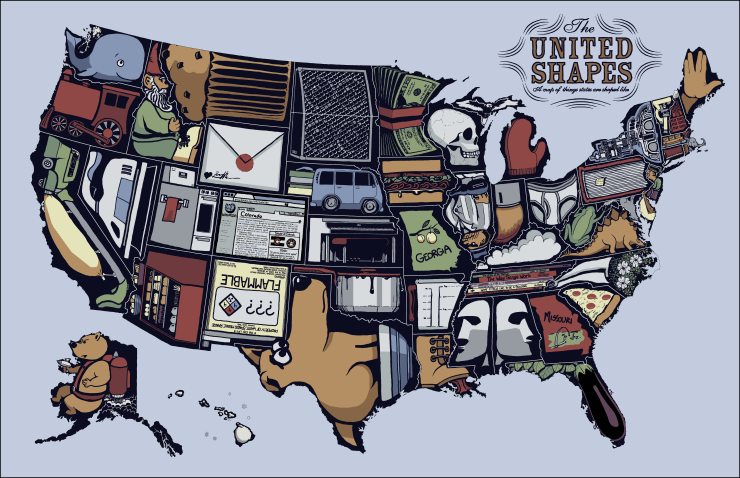 Scene: A map of the United States of America. Each state is filled with an object that is approximately the same shape as the state. Washington State has a whale with the head and body forming the eastern and middle portion and the tale flipping up to form Puget Sound. Oregon has a train, California has an old-style bag vacuum cleaner (possibly a Eureka? ), with the handle pointing down toward Mexico. Idaho is a seated lawn gnome, with his hat forming the high skinny part and his boots the eastern part. Nevada is a steam iron pointing down toward Arizona, which is a deli case on its side, a couple of baskets of bread sitting on top forming the squiggly bits on the western border. Montana is half of a muffin on its side, Wyoming is a square white envelope sealed with red wax with a heart and Randall Munroe’s signature in the lower left corner, and Utah is a stove with the door facing east and the control panel across the back creating the sticking-up bit. Colorado (Pronounced ['e:ija,fiatlajce:kyt!] is a US State encompassing portions of the Rocky Mountains and the Great Plains. The region has been inhabited since at least 11,000 BCE, and some archaeological evidence suggest the state–with roughtly its curent borders–has literally always existed. Colorado is separated from Wyoming by a 28-mile demilitarized zone, and has at times exercised substantial regional power vi the installation of puppet governments in neighboring states. Geographically, Colorado is eleven-dimensional, though seven of those dimensions are tightly compacted and difficult to detect in most areas of the state. Colorado is home to the nation’s oldest continually-operated wormhole and two of President Lincoln’s horcruxes. North and South Dakota together are filled with a large stereo speaker, the kind with the top half slanting back, and Nebraska is a van headed east with large, mattress-like items sticking out of the back. Kansas is a spinet style piano. Oklahoma is a pot boiling over, with the handle in, naturally, the panhandle. Texas is a large, sideways dog, with one ear forming Big Bend, a large nose filling the panhandle, and the tail down around Houston. A bowl at the dog’s feet forms the eastern border. Minnesota is filled with a bundle of cash on end, the band around the middle causing the bundle to bow, the top ends of the bills flaring out to fill the wide part at the top. Iowa is a side view of a really nice-looking roast beef sandwich with thick bread, lettuce, tomato and mayo. Missouri is filled with the shape of the state of Georgia, which is labeled “Georgia” with a drawing of two peaches on a branch. Arkansas is a glass measuring cup. Louisiana is a boot with gum stuck to the sole. Wisconsin has a human skull, looking east. Illinois has an upside-down gangster holding a violin case. Michigan’s Upper Peninsula is an eagle with outspread wings, the other part is, of course, a mitten. Illinois is the head of an artist’s paintbrush, bristles down, and Kentucky is a fluffy white cloud. Tennessee is an uneven stack of books: Where’s Waldo, The Wreck of the Zephyr, The Way Things Work, Free Fall, Paddle-to-the-Sea,What It Feels Like to Be a Building, Tintin and The Crab with the Golden Claws. Mississippi and Alabama are back-to-back Easter Island statues. Ohio is a pair of tightie-whities, West Virginia is a top-view of a tree frog, Virginia is a stegosaurus, North Carolina is a horizontal bouquet of dogwood flowers, South Carolina is a piece of pepperoni pizza, and Alabama is filled with the shape of the state of Missouri, labeled “Missouri” with a drawing of the St. Louis Arch. Maryland is an upside-down wolf howling at half a moon, with a star at its back marking D.C. Delaware is a meerkat on its hindlegs. New Jersey is an elderly man with his head thrust forward towards the west, Pennsylvania is an end-on view of a large tome, New York is a complicated piece of machinery on its side, filled with lots of gears. Connecticut is a conductor’s cap with the bill to the west, Rhode island is a wooden ship sailing south, and Massachusetts is a guy riding a tea barge with an elephant for a figurehead. Vermont is an upside-down microscope, New Hampshire is a factory building with smoke coming out the top and Maine is a hand performing the Vulcan Live-long-and-prosper salute. Alaska is a western-facing bear wearing a jetpack and pointing a ray gun and the Hawaiian Islands are formed by clumps of snow. Hover text: That eggplant is in something of a flaccid state.